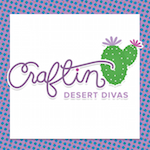 Craftin Desert Divas Blog: Accio Coffee! Hello and welcome! 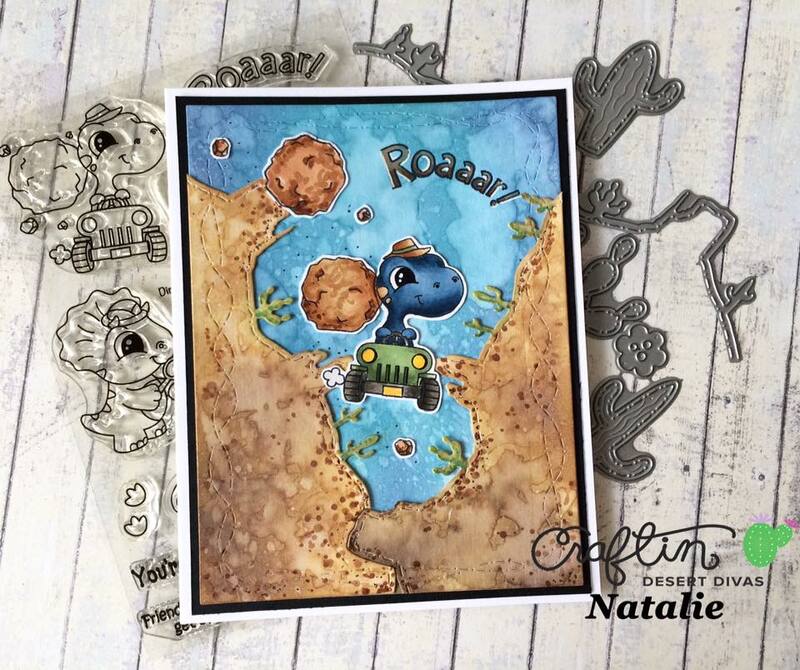 Tatiana is here today from Tatiana Craft And Art and I'm sooooo excited to share with you my first release project featuring fabulous Coffee Wizards stamp set from Craftin Desert Divas June release!!! 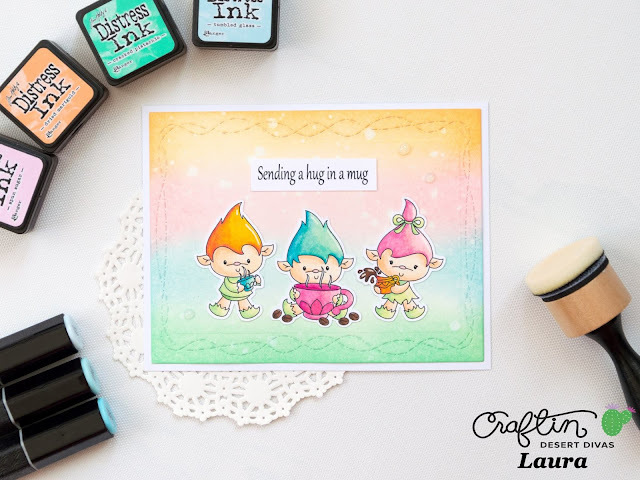 Coffee Wizards stamp set is so amazing and I LOVE the fun sentiments you can find in it and, of course, it's so perfect for creating adorable scenes with the cute mischiefs, including some interactive elements to emulate a little bit of magic! Plus it's fantastic for all coffee lovers friends!!! 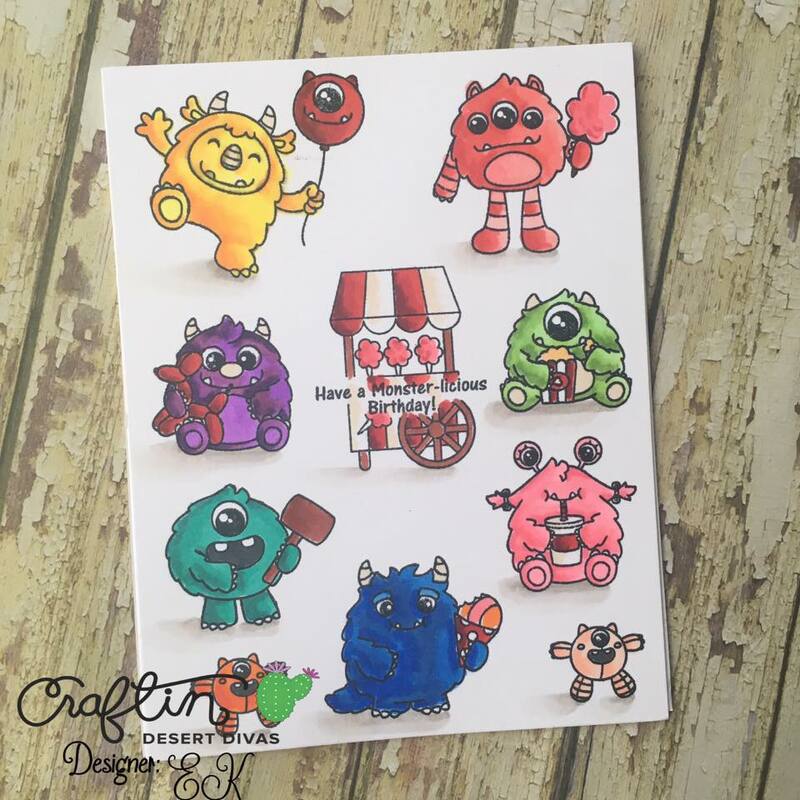 My choice was a shaker card made out of CDD Rainbow Die set. I placed the coffee bag on one side of the rainbow and the fox wizard on the other and then filled the shaker part with some little accessories images from the same Coffee Wizards stamp set along with some clear sparkling sequins creating the illusion of magic! I started by die-cutting the rainbow on an A2 size piece of a white card stock, inkbelding some blue ink around, coloring the rainbow die itself with copic markers and gluing it back directly to the card base. Then I stamped the cute fox wizard, the sentiment and a bunch of small images from Coffee Wizards set and colored them with copic markers as well. 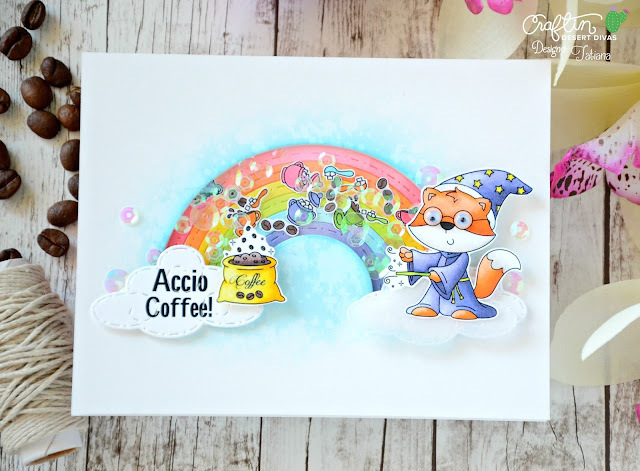 Finally I die-cut "Accio Coffee" Greeting on a cloud that comes with the same Rainbow Die set I used before for the shaker part and fussy-cut with my scissors the colored stamps! Assembling the card, I applied a piece of clear acetate to the back part of my front panel and once filled the shaker part, popped the panel on a foam tape. 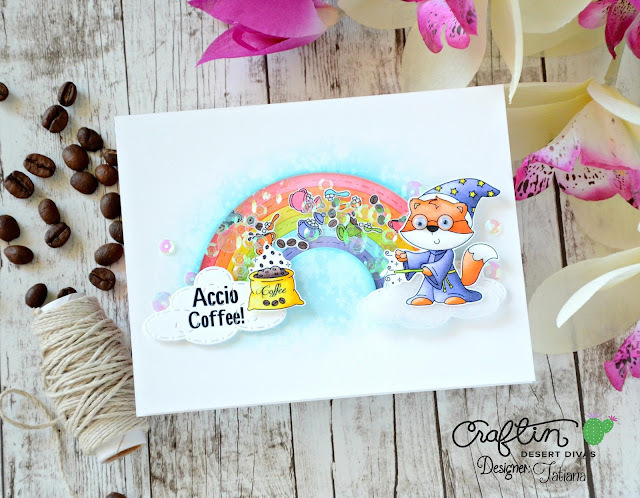 I also added some dimension to the clouds, the coffee bag and the cute fox wizard and just couldn't resist to add a few matching sequins as a final touch! That all for today! 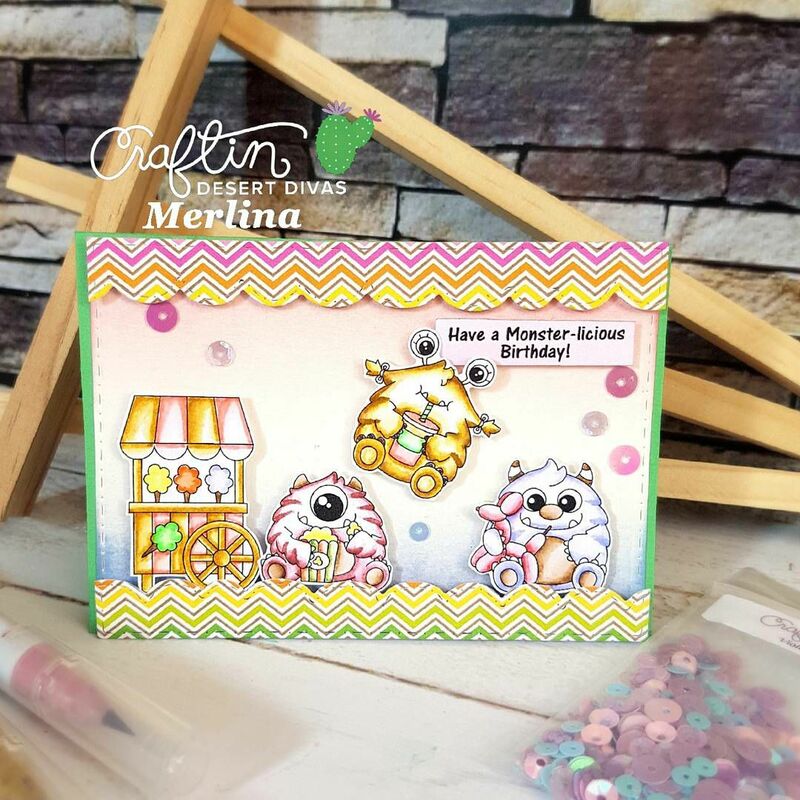 Hope you like this bright and cheerful card! As always thanks so much for stopping by! 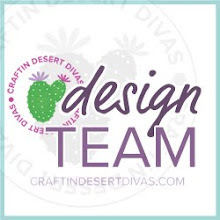 And please, check Craftin Desert Divas Event Page on Facebook for more inspiration, amazing projects from the Design Team, freebies and awesome giveaways! 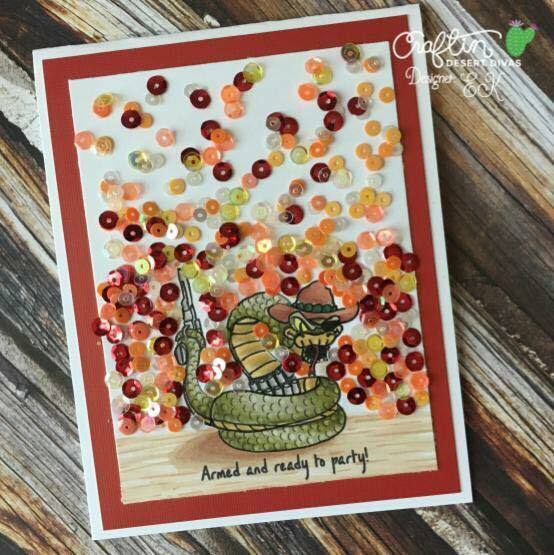 All cards are so beautifully colored! But the coffee one is trully magical.